These Stone Blades are one-of-a-kind productions that you can insert into your own handle. The blade edge is fairly sharp (can be either dulled or more highly sharpened by request). The edge can be used for cutting, however it should be remembered that these blades are primarily handcrafted for use in Collectible Art Pieces. No guarantee or warranty is given relative to usability or durability. When selecting a size, remember to calculate in the desired depth of the haft. The blade size fulfilment may have up to a quarter inch variation. These blades are made once they are ordered and consequently there will be a month delay before shipping. These are perfect if you want a Tapered Convex-Edged Pressure-Flaked Double Edged Obsidian Knife Blade to insert into your own handle. There is some variation in terms of the final tapered shape from slightly to heavily convex. You may request a particular Blade Material, and every effort will be made to fulfill your request, but no guarantee is given that your knife blade will be of the selected material. There will be a month manufacturing delay before shipping. These are perfect if you want a Tapered Straight-Edged Pressure-Flaked Double Edged Obsidian Knife Blade to insert into your own handle. There is some variation in terms of the final tapered shape from straight edge to slightly convex. You may request a particular Blade Material, and every effort will be made to fulfill your request, but no guarantee is given that your knife blade will be of the selected material. There will be a month manufacturing delay before shipping. These are perfect if you want a Tapered Stemmed Pressure-Flaked Double Edged Obsidian Knife Blade to insert into your own handle. There is some variation in terms of the final tapered shape from straight edge to slightly convex. The bottom half-inch has a narrower width (a stem) to aid in hafting. You may request a particular Obsidian Type, and every effort will be made to fulfill your request, but no guarantee is given that your knife blade will be of the selected material. There will be a month manufacturing delay before shipping. This type of Obsidian Knife Blade has been completely pressure-flaked into a right-angled triangular shape that has one sharp curved edge and a back straight dull edge. It is perfect for either a end or side-hafted design. You may request a particular Obsidian Blade Material, and every effort will be made to fulfill your request, but no guarantee is given that your knife blade will be of the selected material. There will be a month manufacturing delay before shipping. 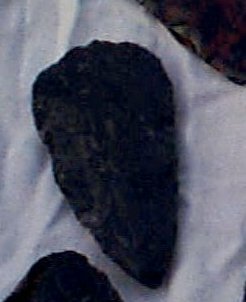 This type of Obsidian Knife Blade has been percussion chipped into a long rectangular shape rather than the more common tapered point. One edge is pressure-flaked sharper than the other. It is perfect for a side-hafted design or for insertion into a multi-blade tool. You may request a particular Blade Material, and every effort will be made to fulfill your request, but no guarantee is given that your knife blade will be of the selected Obsidian type. There will be a month manufacturing delay before shipping. 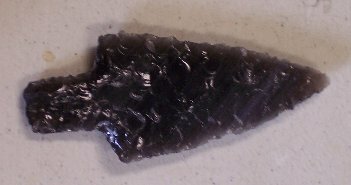 This Blade is a Percussion Obsidian Biface produced only through percussion reduction from the original raw core material with a hammerstone. This particular biface has been specially shaped and thinned for use as a tapered hafted knife blade. There will be irregularities on the surface and areas of uneven thickness across the blade. These bifaces can also be used as rough preforms or blanks which you can then personally pressure flake into a more finished form. You may request a particular Obsidian Type, and every effort will be made to fulfill your request, but no guarantee is given that your knife blade will be of the selected material.